_WeWe are a small home based internet, Local Farmers Markets and Craft Show Business in the Des Moines area. We have around 40 hives in 2010. We produce raw strained honey, gourmet flavored liquid & creamed honeys, some comb honey, goat milk and honey soaps, beeswax lotion bars, lip balm, gourmet beer bread mixes, cheesecake mixes, wine mixes (wine slush mixes). All of our products are produced in our State inspected licensed kitchen. My name is Pat and my husband Tom and I own and operate Randol Honey Farm. I took a beekeeping class to restart 3 hives our son Kris brought home the summer of 2000. Those hives did not make it through the winter and I heard about a beekeeping class in Altoona, Iowa, which I signed up for and took in the Spring of 2001. I then got my first 3 nucleolus and placed them in the empty boxes. Bees became a fascination with me and I expanded in 2002 to 10 hives. 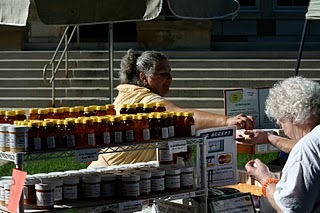 I then took my excess honey to the local farmers market uptown Winterset and that started me on my way to develop all the products that you see on our website today.